Each email sent via SendPulse service must contain an unsubscribe link. If a SendPulse user doesn't provide such a link, the service will insert one automatically. Unsubscribe links can be customized by editing the HTML code of the email template using inline styles. 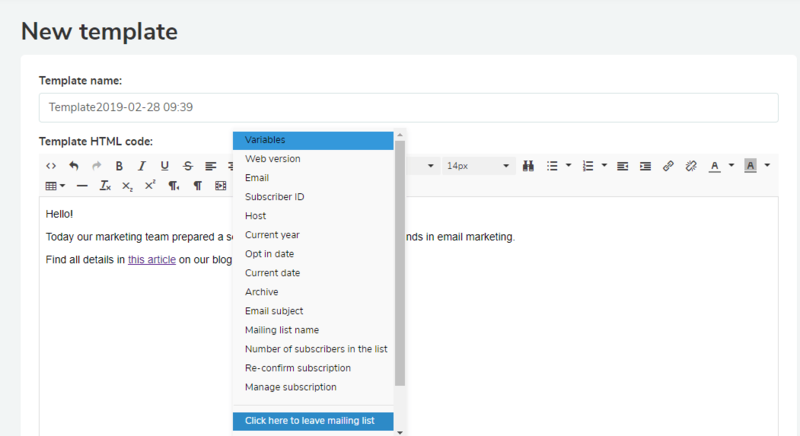 SendPulse users can edit email template HTML code either in the Layout Template Editor or in the HTML Editor. If you use the Layout Template Editor, the unsubscribe link will be inserted automatically. *Mind that the Text Color option can be applied only to the contents of the template, not to the unsubscribe link. This way a person with HTML coding skills can customize unsubscribe link and change its style, color or size. Rate this article about "Customized unsubscribe links"